Ink Volume: 16ml Black, 11ml Cyan, Magenta, Yellow. T1813 Magenta x 3, T1814 Yellow x 3. The Epson XP-422 is a wireless printer, copier and scanner with Wi-Fi connection and an SD memory card space. It also offers a 6.4cm colour screen with a touch panel. 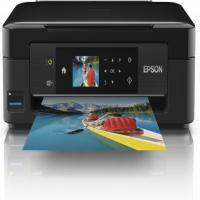 The interface is straightforward on this printer and offers more complex options than other Epson printers. The copier element to the printer is perfect for home and office use but is more compact for use in the home for homework's, or just photocopying bills or documents to keep records. This XP-422 printer offers a great scan interface, which is ideal for those who are wishing to scan family photographs in the home. There is considerable exposure, sharpness and accuracy when scanning images, which is vital when printing from home with a professional finish. A downfall of the Epson XP-422 is the speed of printing. Coloured images are much slower to print. This printer is compatible with T1811, T1812, T1813 and T1814 cartridges, and due to only needing to change the colour you need, this saves a considerable amount of money. Replacing colour and black cartridges only is much more costly. How to clean clogged or blocked printhead nozzles? The Epson XP-422 printer is an all-in-one inkjet printer. It offers WiFi and USB connection. The printer uses Epson XP-422 ink cartridges as consumables. But often print problems such as missing prints or faded prints can be experienced. This is due to clogged print head nozzles. If the printer requires cartridge replacement then the printer screen will specify that. According to the instructions of the printer, first change the ink cartridges if required. Replace with the new Epson XP-422 ink cartridges. Open the printer software on your PC. Go to the Utility tab and click on Head Cleaning button. Follow the instructions given by the software. During the process, the ink and power light will blink continuously. The printer should remain on throughout the process. Turning it off can damage the machine. Once the power light has stopped flashing, go to the Head Cleaning option in the printer software. Now click on Print Check Pattern. The software will ask you to confirm that the print head has been cleaned. Give the confirmation and take a nozzle check pattern test print. If the print is not clear then redo the entire process again. Take a test print again to check. If the test print is still not clear then repeat the cycle about four to five times followed by a test print. If there are discrepancies in the test print then leave the printer on overnight. This will loosen up the ink in the nozzles clearing off the blockage. Repeat the cleaning cycle again and take a test print. If it that does not work you might need to buy new Epson XP-422 ink cartridges or call Epson support. Q. What operating systems are supported by the EPSON XP-422 printer? In Windows OS, Windows XP or later. In MAC OS, Mac OS X 10.6.8 or later. Q. Does the EPSON XP-422 printer support automatic duplex printing? A. This printer does not support automatic duplex printing. Q. A multipack of 18XL cartridges was delivered to me yesterday but the name of my printer EPSON XP-422 was not written on the box. Does this mean that I’ve ordered cartridges that are not compatible with my printer? Q. I am in need of more black cartridges than colour cartridges. Can I choose to buy 6 Black ink cartridges and 2 ink cartridges of every other colour in a multipack of 12 EPSON XP-422 ink cartridges? A. Yes, you can purchase EPSON XP-422 ink cartridges in that combination or any other combination. Q. Can I print pages by just using the T1811 Black ink cartridge on my EPSON XP-422 printer? A. You cannot print pages by just using black ink because to maintain optimum print head performance, this printer consumes some ink from all cartridges not only during printing but also during maintenance operations such as print head cleaning and ink cartridge replacement. Even if you print on monochrome settings, some colour ink is used depending on the paper type or paper quality settings. This is because a mixture of colour inks is used to create black. Q. I ordered a multipack of EPSON XP-422 ink cartridges from this site. How can I track my order? A. Once you have placed the order you will get the unique order ID with which you can track your order with our courier company. Q. While printing a document, i faced incorrect or missing colour problem. How can i resolve it? Q. What can be done if the printer performs slow printing ? Q. How should I set up my Wi-Fi enabled All-In-One without the network setup cable? A. The automatic Wi-Fi set-up configure the laptops and computers to print and scan wirelessly extremely easy. You do not need to bother about your network settings as the Epson XP-422 will automatically find out the relevant connection setting in order to configure itself. For addition Wi-Fi Direct® allows easy printing from compatible wireless devices without the need for a network. Q. What size is the memory card slot on the XP 422, would a microSD work? Q. What are the cartridges used in this printer? A. T1811, T1812, T1813 and T1814 are the cartridges compatible with this printer. All available on our site. Q. Do I need to replace all the cartridges of EPSON XP-422 though only black cartridge’s ink has been exhausted? A. No, Epson XP-422 enables you to change only the exhausted cartridge with its individual cartridges slots. You can replace only the black EPSON XP-422 ink cartridges thereby saving money. Q. I wanted to make a bulk order of your compatible EPSON XP-422 ink cartridges for my office. Do you provide deliveries for bulk orders? If yes, then where can I check whether you have sufficient stock of cartridges or not? A. You can always approach us for bulk orders. We deliver all over Ireland. If your cartridge is available and you place the order before 2 pm, we will dispatch your order on the same day. For checking on the stocks and further assistance on bulk orders feel free to call on 048 30833221. Q. Is there any minimum quantity of ink which I can expect in the EPSON XP-422 cartridges? A. The EPSON XP-422 ink cartridges come in two variants i.e. original and compatible version. The compatible ones have more ink quantity than the original ones. The compatible version has 16mL of ink in the black cartridges and 11mL for rest of the colours while original cartridges have 11.5mL ink in black cartridges and 6.6mL ink in rest. Q. How much more result does your compatible 18XL EPSON XP-422 cartridges yield when compared to the original ones? A. The compatible cartridges we provide yields more prints than the original ones. The compatible EPSON XP-422 ink cartridges yield 60% more result providing equivalent quality as of the original ones. Q. What is the procedure to install the EPSON XP-422 ink cartridges in the printer? Q. EPSON XP-422 being a printer suitable for home use, can it be used for heavy printing at my office? A. EPSON XP-422 is considered a printer suitable for home due to its small size. The printer is efficient for printing large copies of commendable quality. EPSON XP-422 is a good choice for office work since it takes less space and the prints are fast as well as of good quality. The only problem you might face is reloading the paper tray frequently since the capacity of paper tray is 100 sheets, which might be less for an office. Q. Do you deliver cartridges in Liverpool, UK? A. No, we are sorry but we don’t deliver to UK. We only deliver in Ireland. Q. What happens if I fail to collect my delivery? Do I have to order again? A. Our courier partners (Fastway couriers) deliver orders between 9am - 5pm (Monday - Friday). They will attempt to make two deliveries to your door and any unsuccessful deliveries will be returned to their central depot or to our warehouse. Any further delivery attempt will incur an additional charge of €4.95 including VAT. If there is any time constraint or deliver related query contact our customer care service for assistance. Q.Do you offer any guarantee on EPSON XP-422 ink cartridges?